Garlic & Parmesan Chicken "Risotto"
Fire up the grill for some mouthwatering grilled chicken. Follow these tips to sizzle your way to tender, flavorsome chicken. Enjoy crispy roast chicken right at home. These tips will teach you how to select, prepare, cook and carve the perfect chicken. Chicken Broccoli Rice is rated 4.7 out of 5 by 148. Rated 5 out of 5 by mike 329 from amazingly good I find all the Knorr rice dishes good and available in my area,,THIS one is particularly good.....add chicken and have a feast!!!!! 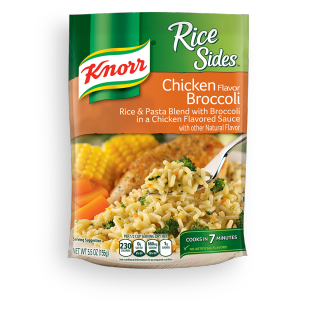 Rated 3 out of 5 by megtheotter from The Knorr Rich Sides Chicken Broccoli Rice is pretty good for the price. A quick, easy and filling side on the cheap. It tastes pretty good but I found that it can be easy to mess it up. You have to make it JUST RIGHT to get a good flavor otherwise the taste is a bit off or the rice isn’t cooked properly enough. I’m not sure what it is but I tend to always have a hit or miss when it comes to cooking sides in these types of packaging. Taste-wise it is pretty good, not the best but decent. Easily a super affordable item. I’d recommend it just because it is easy to make and when done right it tastes good enough. Rated 4 out of 5 by kevhead from delicious side Served this with italian chicken breast and was perfect. All my teenage kids loved it. Wish it came in bigger serving sizes. Rated 5 out of 5 by Sharon44 from Great flavor! I cut up and cooked two thighs and one large chicken breast and it was the perfect amount. When cooked, I set aside per instructions. Instead of water, I added one can of low sodium chicken broth plus enough water to make one cup of liquid, then added your rice and packaged seasonings. While that cooked, I steamed 1/2 bag of frozen broccoli, then cut up and added to rice. After simmering with chicken I served with sliced tomatoes. My husband LOVED it!